Looking for an innovative JT converter for your business, you will sooner or later encounter the convincing advantages of 3D_Evolution CAD Converter. 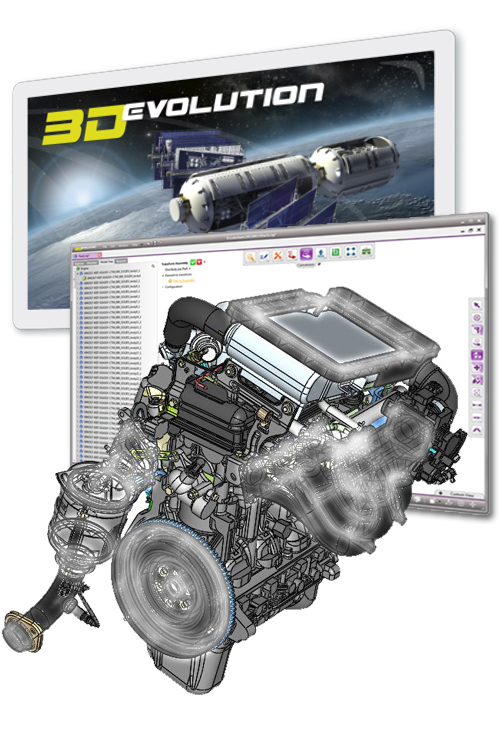 This sophisticated Conversion Engine supports JT as well as all other major native and standard formats such as CATIA, NX, Creo, SolidWorks, Inventor, IDEAS, STEP, XT format, 3D PDF and many more. Nowadays streamlined processes and cost reduction plays a major role for technology-oriented companies and a time-saving CAD conversion of 3D models is more important than ever. Only with a powerful JT converter all partners of the design teams can be successfully integrated in the development process with a car manufacturer. With our Daimler certified 3D_Evolution JT converter you can create a seamless process chain of 3D files not only for JT and also for all other CAD Formats. Using the CoreTechnologie JT converter you are independent with the interfaces of the leading provider of CAD converters and also have access to native CAD data, without any license of the CAD system. With our JT converter you will also always receive the highest quality of models by using the automatic healing functions that correct and repair any inaccuracies or errors. With impressive Advanced Repair functions we also offer a simple repair of frequently occurring errors in 3D geometries. With the 3D Evolution Converter as your JT Converter you can look forward to an outstanding and easy to use graphical interface. For the conversion of large amounts of data a batch mode with native scripting language is available. The batch can also be easily integrated into existing systems. 3D_Evolution was developed so that you as a company can have a flexible and simple CAD data exchange with your business partners. The 3D_Evolution JT converter also has the capabilities of PLM XML and STEP AP 242 structure files, different levels of details and supports the reading and writing of attributes and semantic PMI. In addition the generation and verification of moniker identifiers for surfaces is available with our JT converter. Moreover 3D_Evolution has a Daimler certified JT Checker to verify JT according to Daimler criteria. 3D_Evolution not only has a certified Daimler JT converter, but also a number of other useful modules that help you when dealing with CAD data. Using our geometry simplification for example creates envelope geometries in a matter of seconds and removes the inner geometry of CAD models. CoreTechnologie additionally offers a low-cost CAD Viewer, which can read all available CAD formats.